The 16th Gyalwa Karmapa, is well known for his visions and prophesies, one such divine manifestation is commonly known as the 'Kagyu flag' and more famously called the 'dream flag', in reference to the fact that the banner appeared to him in a dream. 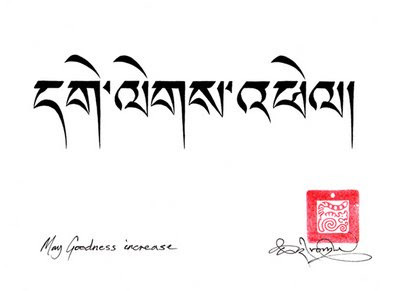 He named the banner 'namkhyen gyaldar' meaning "Victorious Flag of Buddha’s Wisdom”. Since the birth of the flag, there has evolved a few different versions of the Karmamap's dream flag, most of these versions seem to have strayed from the flags' original legacy; as perhaps its new creators simply did not know and appreciate the profundity of its sacred geomantic construction. This blog post is to explain and re-introduce the original proportionate construction and meaning behind the banner. There is also a true version of the dream flag that can be freely taken and reproduced for your own purposes, found at the bottom of this post. construction and shades of colour. During the early 90's Tashi was asked to reproduce the Dream flag by the Samye Ling Monastery in Scotland, who's intention was to donate the flag to Karma Kagyu Buddhist establishments around the world, in order to replicate the flag correctly, in respect of its original design. One such original design of the banner hangs framed on a wall of a The seat monastery of H E Jamgon Khontrul Rinpoche in Pullahari, above Boudha, Kathmandu. 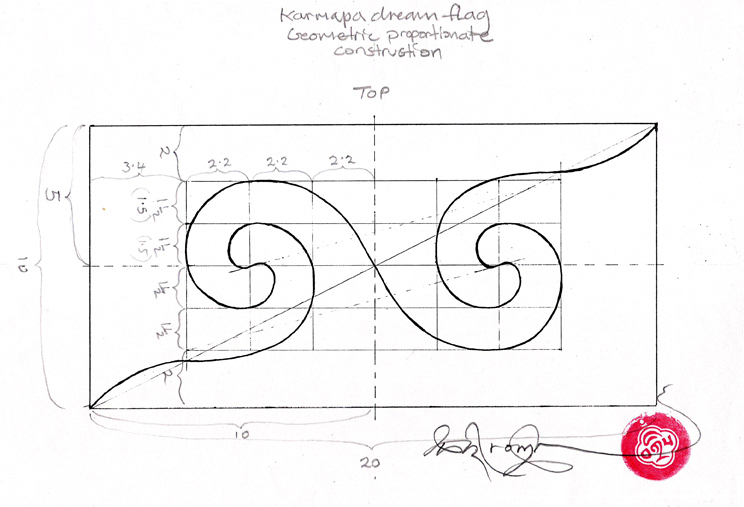 Tashi was sent to investigate the flag with instructions to take notes so to replicate the flag correctly to the right design and dimensions. The other reference of the flag, was personally explained to Tashi by H E Situ Rinpoche. As Situ Rinpoche was witness to the original creation of the flag while together with his Guru H.H. the 16th Karmapa. The proportionate construction of the dream flag. Confirming the correct construction of the dream flag. 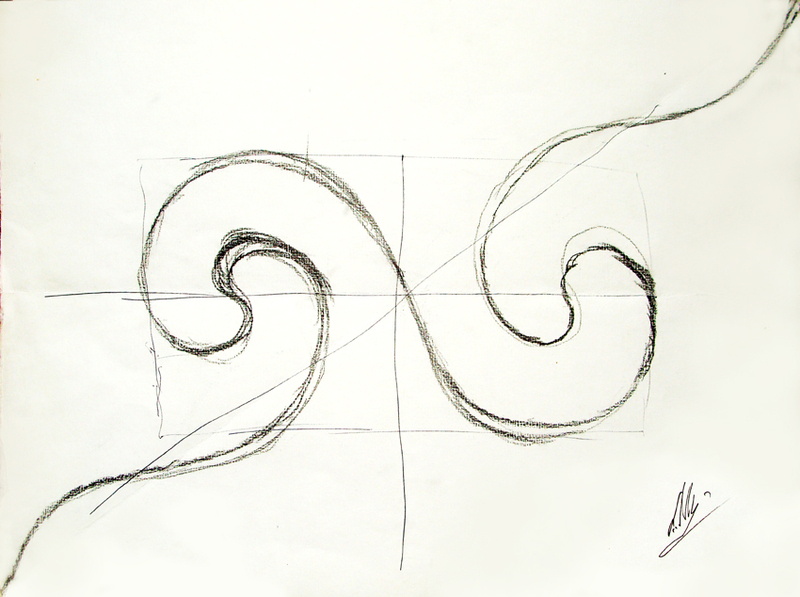 The sketch above is by the hand of Situ Rinpoche, (note his signature bottom right) who made the drawing especially for Tashi, explaining the geomantic arrangement of how the two waves are approached and swirl together from all four directions: two sides, top and bottom. It is also important to noted that in this drawing; the over-all dimensions of the flag was dependent on the dimension of the piece of paper to hand at the time. Never-the-less, the same proportionate construction of the waves should not be altered from their horizontal axis when applied to a more standard 2:1 flag proportion, as shown in the image below. 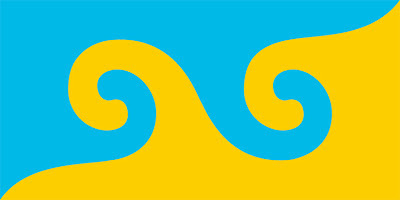 The possible reason for the misinterpretation of the wave alignment placed on a sloping axis in other corrupted versions of the flag, could have been confused with to the angular division between the two colours of yellow on the bottom side and blue on the top. This division runs from bottom left up to top right corners, as if aspiring from earth to heaven. It seems that such profundity of design could have easily been overseen, if not fully understood while creating the banner and lead to the misrepresentation of the dream flag. The correct proportionate lined construction of the banner is shown more precisely on the diagram below. This is has also been designed to fit with the international standard 2:1 flag proportion. from the instruction of Situ Rinpoche, 1993. The colours of the Flag. Moreover, Situ Rinpoche explained the colours of the flag to be a bright sky blue and should not be too dark, the yellow should be earth like, not Lemon yellow and compliment the sky blue in tonal brightness, as the far below colour image shows. To demonstrate the correct balance of tone, the flag colours in the image directly below, have been converted to black and white. As you can see there is little difference between the tones, which indicates a similar balanced in brightness within the colours. The contrast that catches the eye is more in the colour rather than with the tone, as the particular blue and yellow used is far apart in the colour spectrum and complimentary. The tonal balance of the Dream flag. The meaning behind the dream flag. The elements of the flag's geomancy and colours are symbolic of the relative and absolute truth. 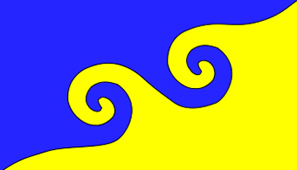 Relatively the colours blue and yellow represent the sky and the earth, the waves symbolize the Buddha Dharma. On the absolute level the colours represent the union of emptiness and clarity, the true nature of mind. The intertwining waves symbolizes the union of compassion and emptiness, which is the essence of all phenomena.  The Karmapa's official Namkhyen Gyaldar Dream Flag. Please feel free to take this above image for your own use and publish it in keeping with the Karmapa's wishes: that wherever this flag graces, Dharma will flourish. Thank You. Much Appreciated. I can see the differance and i believe it does matter. Do you know a reputable place to purchase a Karmapa Dream flag? Recommendations? Thanks! The geomantic version definitely gives a kind of shock to the mind that the incorrect versions do not. Thank you! The only flag worth pledging your allegiance to... ever! It turned out that the Karmapa Dream flag is very close in colors to Ukrainian blue-yellow official flag. 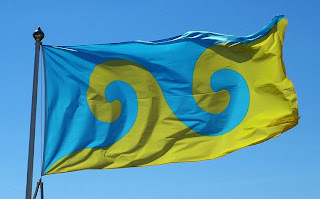 That's why I've translated the Dream Flag story into Ukrainian: http://ahamot.org/ukrajinskyi-prapor-i-mahamudra/ I hope that having a banner resembling Karmapa's will really bring Dharma flourishing to this country. KARMAPA CHENNO! 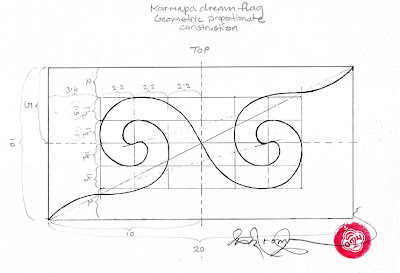 It is confusing for me, that first flag made by Deborah Luscomb directly based on HH 16th Karmapa hand drawings and consulted with him is marked as incorrect here. Is history of flag origin written on http://www.brocades.net/history.htm fake? Thanks for reply. Yes I am aware of Deborah Luscomb's rendition of the dream flag, this may indeed be where all the confusion stems from. 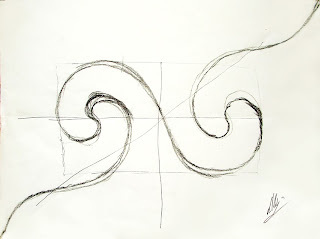 Quote: "I sketched out on graph paper what I thought represented the complete symmetry of his drawings (16th Karmapa)". I do not think that this claim is 'fake' but perhaps misunderstood or at least a lack of clarity in symmetry. But more to the point and relative to today, is that H.H.17th Karmapa has officially confirmed with his own current drawing of the correct proportionate symmetry and exact choice of colours. The version of the Dream flag understood by Deborah Luscomb is already history, it probably was "The first Dream Flag raised on Midsummer’s Day" confirmed by the 16th Karmapa, but not as it is wished to be portrayed today by the 17th Karmapa, and between then and now, H.E. Situ Rinpoche, as explained in the above article, went to detailed lengths to explain the missed profundity of the flags symmetry that had caused the misrepresentation of the Dream flag which had become commonly replicated. Thanks for provided details. Much Appreciated. a couple of years ago our car broke down and we had to replace it. I had a sticker of the dreamflag in a window and couldn't move it to the new one. Searching for new stickers to buy I could not find it but after some searching I found your blog and followed the instructions, had a web-designer make a correct pixel by pixel template which I then used to have stickers printed. They came out nicely and I have more if people are interested. This first batch was digitally printed, and I would like to have a next batch printed in off-set to get even better quality. For now these fly mostly on some German cars. The template should also work to make flags of any size from them. I will make it available if someone is interested. Hi Jens - How do we get in touch with you? perhaps you can leave an email address, as I am sure there will be some interest. It is rare to find good reproductions of this Dream-flag, stickers and actual flags. Thank you for taking this upon yourself to create.